Well instead of looking at the latest in home technology on store shelves, Best Buy is bringing a homelike environment to you, where you can touch and try! Right now, you can check out one at the Mall of America in Minnesota. Sponsored by Samsung SmartThings, you can find out how to control and monitor the systems in your home with your smartphone. That means you have access from anywhere! 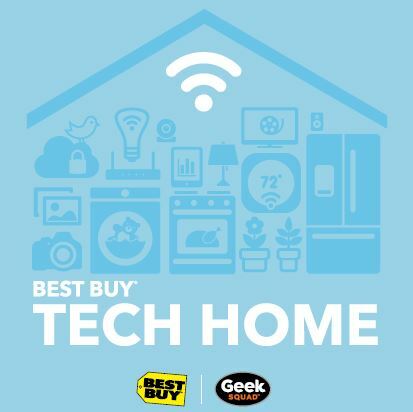 Tour the Best Buy Tech Home with an expert Blue Shirt or Geek Squad Agent and experience products from Samsung, Canon, NETGEAR, Philips Hue, Sony, Sonos, and Savant. The Blue Shirts can help you find exactly the right solution for you and your home. If installation has you dragging your feet, no worries! The Best Buy Geek Squad Agents can get your tech connected and up and running. There is so much to see, from the Samsung SmartThings Smart Outlet that let you use your smartphone to control a light, electronic device or appliance to the Samsung Family Hub Smart Refrigerator, with 3 built-in cameras allowing you to view your groceries inside your refrigerator while you are on-the-go, and lots in between. In it to win it? Well, there are TWO sweepstakes opportunities at Tech Home. The prizes will have you saying, WOW! · Come and visit Tech Home at the Mall of America to learn how you could win a $10,000 Best Buy Gift Card, a Samsung SmartThings Smart Home Collection, Samsung Dream Kitchen, and a Samsung 55” SUHD 4K TV and more. · Be one of the first 250 to visit the Tech Home at the Mall of America each day from 8/22-9/17 and you could win one of many prizes made with Qualcomm technologies including Sonos Play:1 speakers, Samsung Gear S2, and more. · No purchase necessary. See www.BestBuy.com/TechHome for full rules. Head over to the Mall of America and good luck!